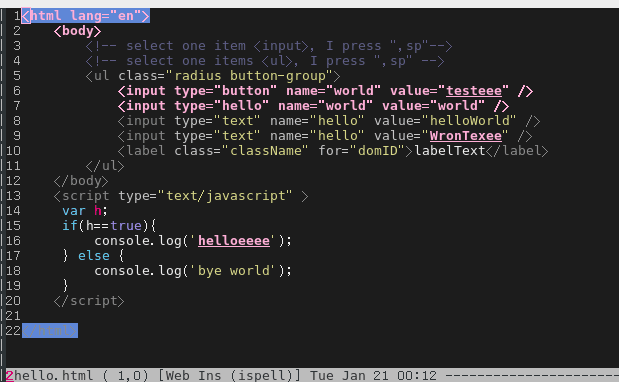 I use Flyspell in web-mode as sample. Other major modes also works. ;; Check the words with these font faces, possibly. I use web-mode for HTML files. The technique applies on other modes (php-mode, html-mode ….) . Modern CSS frameworks like Bootstrap make doublon unavoidable. For example, CSS class name btn btn-default contains double word btn. We can check camel cased string/variable/function if and only if aspell is used. EmacsWiki suggests (flyspell-prog-mode) which only checks typo in comments. But as I proved, Emacs gives you full freedom to design a different solution. If you fully understand my previous sections, you don't need read this section.